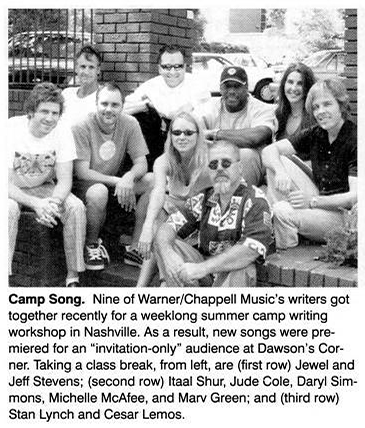 Nine of Warner/Chappell Music's writers got together recently for a weeklong summer camp writing workshop in Nashville. As a result, new songs were premiered for an "invitation-only" audience at Dawson's Corner. Taking a class break, from left, are (first row) Jewel and Jeff Stevens; (second row) Itaal Shur, Jude Cole, Daryl Simmons, Michelle McAfee, and Marv Green; and (third row) Stan Lynch and Cesar Lemos.